Boss Dean Austin says teenagers Morgan Roberts and Sean Whaler ‘fully deserve’ their professional contracts - but has warned the pair that ‘the hard work starts here’. The 17-year-olds have put pen to paper on senior professional deals at Sixfields, with Whaler now tied down until the summer of 2020, and Roberts until 2021. Both Whaler and Roberts have come through the academy ranks at the Cobblers, from the age nine, and last season found themselves training with the first team after excelling for Town under-18s team. They immediately caught the eye of Austin in his role as assistant to Jimmy Floyd Hasselbaink, and then he was made caretaker boss he included them in his first team plans, with Roberts making his Cobblers debut as a late substitute on the final day of the season. Austin was last weekend made the permanent Town boss, signing a two-year deal, and he has handed Roberts and Whaler the chance to show they have what it takes to make their way in the professional game. “Both of the boys fully deserve their contracts,” said Austin. “They have both really impressed me and are members of the first team squad on merit, but, as I have said to them, this is where the hard work starts. Austin has a proven track record in developing young talent, having spent the past 13 years coaching at all levels from league two through to the Premier League. So what is it about Roberts and Whaler that has caught the former Tottenham Hotspur defender’s eye? “Morgan has a very mature attitude for a player so young,” said Austin. “For someone who is creative, he enjoys the physical side of the game and he is very demanding both of himself and those players around him. “I was impressed with the way he handled himself when he came on late against Oldham, he looked very much like he belonged. “Sean has a lot of energy and pace and has developed his game to be a real goal threat. The pair become the latest Town youth team products to earn senior contracts, with in the recent past the likes of Luke Chambers, Michael Jacobs, Ivan Toney and Shaun McWilliams all making their mark. And Austin is delighted with the work of the club’s academy, which is headed up by Trevor Gould, and believes there is more talent on the way. “It is always good to see local boys who have been with the Academy since they were very young come through and it does show the pathway is working,” said the Cobblers boss. 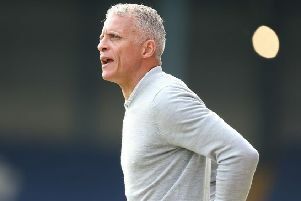 As well as the players who have come through and represented the Cobblers, others, such as Fraser Hornby at Everton and Glenn Middleton at Rangers, have been snapped up by bigger clubs, and Austin says that can only be good for the reputation of the Town academy, and help them attract even more talent in the future. “When you think of the players who have already moved on through EPPP (Elite Player Performance Plan), I think Trevor and the team at the Academy here deserves a lot of praise for the players they are producing,” declared Austin.